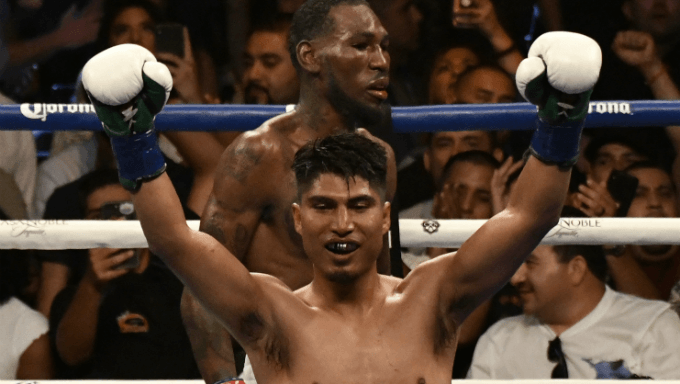 Four division world titleholder Mikey Garcia is daring to be great. Garcia, 30, from Oxnard, California, will jump up two weight classes to face IBF welterweight champion Errol Spence on March 16 at AT&T Stadium in Arlington. The bout features two undefeated world champions in the prime of their careers, and the promotion will be Fox Sports’ first foray into the boxing pay-per-view market. But Garcia faces long odds. Ladbrokes opened the market with Spence at -400 to defeat Garcia at +275. Does Garcia’s team know something the bookies don’t? Pick your favorite pound-for-pound top-10 list. Garcia (39-0, 30 KOs) is on it, and he’s ranked pretty high. According to the Transnational Boxing Rankings Board, Garcia is the sixth best fighter in the world regardless of weight class. But weight classes exist in boxing for a reason, and Garcia isn’t a welterweight. He’s probably not really even a junior welterweight. While he’s competed there fairly recently, his most natural weight at this point in his career is most assuredly lightweight. Sure, Garcia defeated two prominent 140-pound fighters, Adrien Broner and Sergey Lipinets, in contests just seven pounds south of the 147-pound welterweight limit. But Garcia vacated the alphabet belt he won at 140 against Lipinets to return to lightweight in July 2018 for a lightweight unification fight against Robert Easter. If Garcia was even a real junior welterweight at this point in his career, why didn’t he just stay there? And while Garcia’s excellency prevailed against Easter, the technical mastery that makes Garcia so proficient a fighter in the lower weight classes isn’t likely to transfer up so easily to welterweight. Pure skill can only take one so far up the scales. Spence, 28, of Desoto, Texas, isn’t just some welterweight titleholder. His nickname is “The Truth” for a reason. Many in the sport consider Spence (24-0, 21 KOs) to be the best welterweight in the world and one of the top fighters regardless of weight class. According to The Ring, Spence is the ninth best pound-for-pound fighter in boxing, and he’s receiving such acclaim from sharp ratings panels without even having lured the other best welterweights in the ring to fight him yet. Spence is the boogeyman of the division. He’s fast, strong and nasty, and none of the other notable welterweights who would make promotional sense to take the test, such as Keith Thurman, Danny Garcia and Shawn Porter, have been in a rush to experience what Spence has to offer. Like Garcia, all of them would be underdogs against Spence, too. Is Backing Garcia Early Smart? While such tactics might get him through all 12 rounds against Spence in March, it’s not likely to win the fight. When a fighter moves up in weight, he either needs to have serious power or otherworldly speed to go along with technical precision. Preferably, he needs both, and Garcia has neither. In 2008, when Manny Pacquiao moved up from lightweight to welterweight to defeat Oscar De La Hoya, it wasn’t that Pacquiao was technically superior to De La Hoya. It was that Pacquiao possessed an incredibly rare combination of speed and power that came up to welterweight with him. Moreover, Pacquiao was facing a fighter in De La Hoya who was standing on his last legs as a world class fighter. The same was true for longtime welterweight Ray Leonard when he shocked the world by defeating Marvin Hagler at middleweight in 1987. De La Hoya and Hagler were older fighters looking for one last hurrah. Spence is a young champion with his best days as a fighter still ahead of him. The bookies know the score. That’s why the odds are longer for Garcia over Spence then they were for either Pacquiao or Leonard in their bouts. So, while the promotional angle for the bout will undoubtedly throw out lofty comparisons of Garcia being similar to Pacquiao and Leonard, these comparisons fall apart upon any kind of real inspection. Backing Garcia just doesn’t make much sense at the open, and it probably won’t make any sense on fight night either.